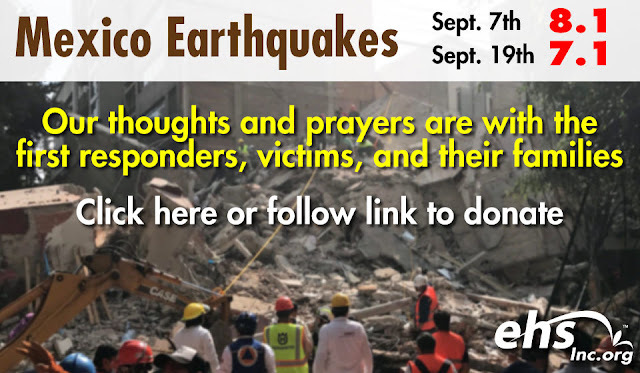 ehsInc Blog: Mexico Earthquakes - Please donate today! Mexico Earthquakes - Please donate today! In this month alone, Mexico has had two catastrophic earthquakes, just weeks apart. The first earthquake with a magnitude of 8.1, happened on Sept. 7th, in the southern coast of Mexico, killing at least 90. The most recent earthquake with a magnitude of 7.1 happened on Sept. 19th near Mexico City. The death toll is at least 216 people. This particular earthquake eerily occurred on the same day of the 8.0 earthquake from 1985. Our thoughts and prayers are with the first responders, victims, and their families. To donate towards rescue efforts please click below or on the graphic above.